The Hyperforks are weighing forks which creates an autonomous weighing system functioning independent of the truck. The weighing forks can be quickly installed on the carriage plate and are easy to exchange between trucks: signal transmission between the forks and the indicator within reach in the cabin is via radio frequency transmission, there is no cabling. 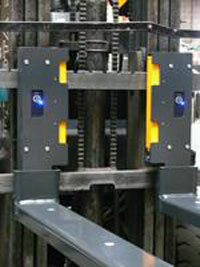 With the Bruss Hyperforks you can weigh pallets and containers during transport, right where the handling takes place. You save time in checking incoming and outgoing goods, in determining expedition weights and in filling big bags in production. The exchangeable battery module guarantees a continuous use of up to 4 weeks. For special options the standard dimensions can differ from the above standard specifications.